TimberSeal, LLC provides rust stain removal services to customers throughout Northwest Indiana, Southwest Michigan and the Chicago land region. 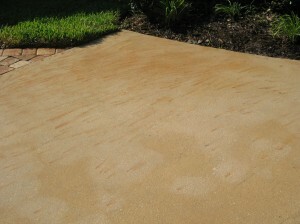 Irrigation rust stain removal, battery acid rust stain removal, iron staining removal. TimberSeal, LLC provides professional rust and iron stain removal for residential, commercial and industrial clients in Northwest Indiana, Southwest Michigan and parts of the Chicago land region. Rust and iron staining can be quite unsightly. These stains accumulate and detract for the overall curb appeal of your home or business exterior, concrete drives, sidewalks and paver surfaces. Some rust stains are caused from the iron in fertilizer applications while others are due to irrigations systems that have excess iron in the water. 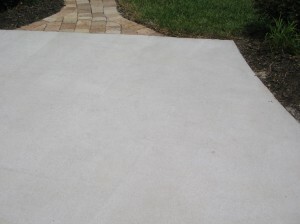 Other instances result from golf carts or similar vehicles leaking battery acid which in return leave an unsightly orange stain on and running down your driveway. The good news is there’s a solution!